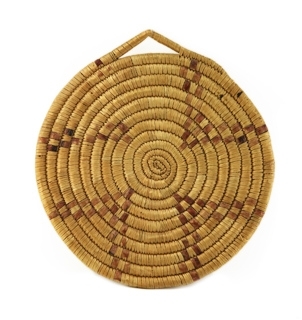 Antique Alaskan Baskets are highly prized and very collectible. Indigenous peoples from this region include the Tlingit, Attu and Haida. The techniques of basket weaving have been handed down from generation to generation and Alaskan Baskets not only exhibit extremely fine weaving techniques but often have pictorial elements picturing Alaskan Native life. Early baskets made for food gathering and storage transitioned over time to tourist forms such as trays, small baskets with lids and covered bottles. Lidded baskets are highly sought after as the shape requires great skill to fit properly. Museums celebrate Alaskan baskets for the quality of their weave, bold geometric designs and pictorial elements.